As temperatures dipped in the Bay Area, Kelly and I headed south to soak up some good old Southern California sunshine. Our trip included some of my favorite things in life: Family, friends, food, music and baseball. The culmination of our road trip was a fabulous meal prepared with friends Mickey and Rachel Thomas, and an interview with Mickey about the role cooking plays in his life. The beginning of our trip was in beautiful Pismo Beach where we enjoyed dinner with Kelly’s mom, Linda and her stepfather, Travis. Kelly frequently talks about how much she enjoyed her mom’s cooking growing up and Linda’s delicious barbecued pork sandwiches did not disappoint. On the way to our second stop in Pasadena, we managed to fit in some disc golf at the historic Oak Grove Course. Our second evening was another treat – I met Kelly’s dad, Bruce, and his partner Cynthia. They are a couple of gourmets. Cynthia treated us to the most delectable baked salmon with potatoes (roasted with bacon drippings, yum!) and her famous orange cake. After dinner, Bruce took us for a spirited cruise in his custom modified ’38 Studebaker. Day three’s itinerary led us east to Joshua Tree National Park for a night of camping on the desert floor. We enjoyed leftovers of salmon and potatoes and were treated to a brilliant night sky before bed. The sparkling stars provided some comfort overhead, however the desert floor did not. Our next trek was by foot on a 9-mile hike to and from Lost Palms Oasis following which we headed directly to the nearest store we could find to buy camping air mattresses. Four nights of comfortable beds and comfort food lied ahead with my dear friends Mickey and Rachel Thomas. I consider them family, and they treated us like family in their lovely Palm Desert home. Many of you know Mickey as a talented musician from his days with Jefferson Starship and Elvin Bishop. 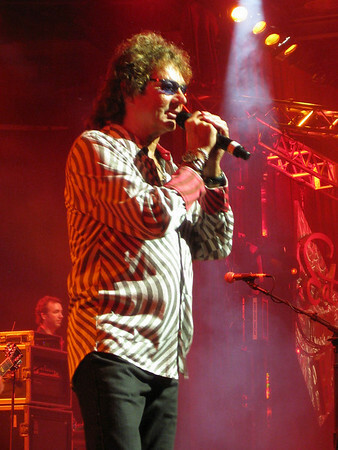 He continues making fantastic music as he records and tours as Starship featuring Mickey Thomas. We spent our time telling stories, creating some incredible meals, drinking great wine, watching playoff baseball and ending each evening with a scary movie in the spirit of Halloween. What many of you may not know about Mickey is his passion for food. Dinner with the Thomas’ is always a treat, whether Mickey or Rachel is cooking. They are both very talented in the kitchen and two of the sweetest most down to earth people you will encounter. After greeting us with a fresh Pasta Primavera dinner, Mickey and Rachel graciously allowed us to take over their kitchen the following night for a meal we prepared with risotto and mussels. We spent our last day making a video for Noah’s Wish – Mickey and Rachel’s favorite charity – and planning our last feast. Creating this feast was like a musical performance with all four of us in the kitchen creating six dishes that were to die for: Rachel’s secret barbecued chicken wings, stuffed eggplant rolls in marinara sauce, Vietnamese shrimp meatballs, Southern scallops with black beans, Greek salad, and spicy shrimp lettuce wraps. The story of this feast unfolds here, in this slide show and interview with Mickey Thomas.